Leaving Gili was hard and it was good to have a new adventure ahead. 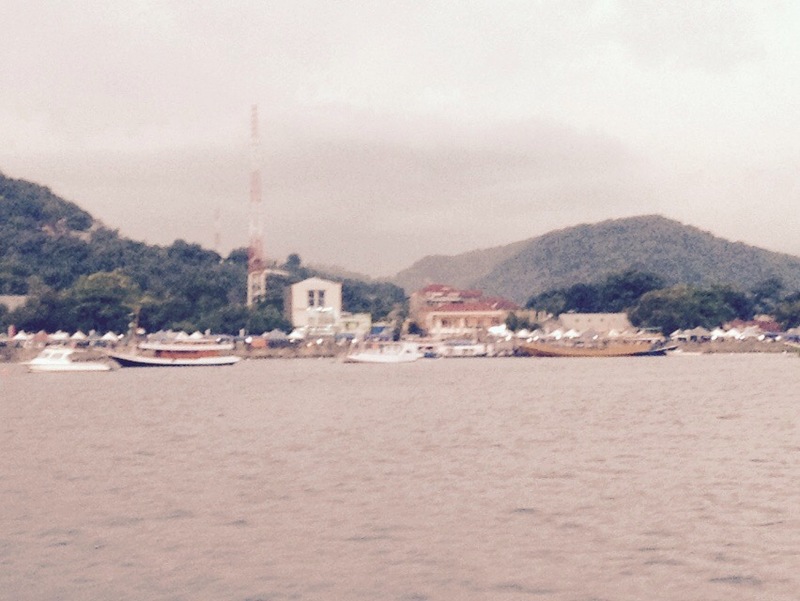 16 new friends heading east by boat was an exciting prospect as we waited in a cafe in Lomboks harbour, Bangsal. I was expecting basic, which was lucky as the boat was the first word in basic. A small deck, 6 Indonesian crew members and everyone sleeping on mats on the roof. The rain started simultaneously with our departure and made the space available seem very claustrophobic. 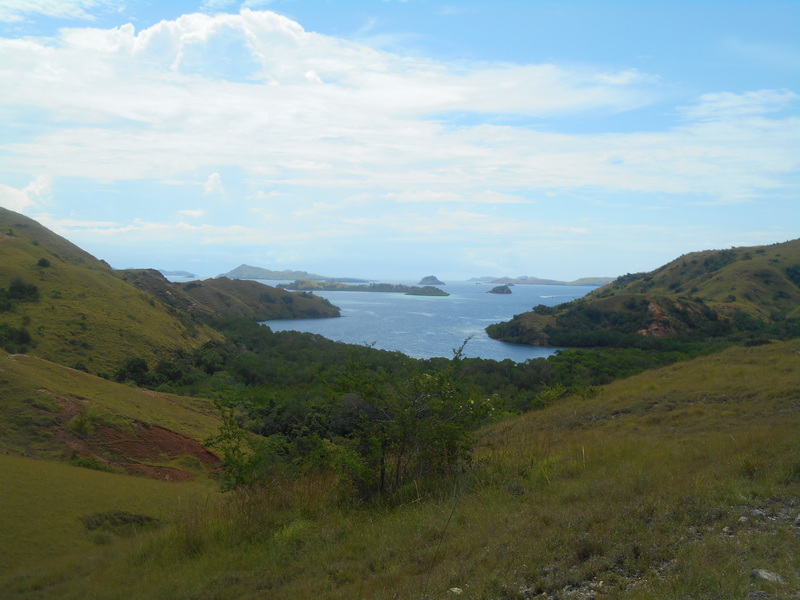 We skimmed the Coast of Lombok, rolling hills to our right hand side. As the rain streamed we passed grey horizons and exhausted our repitoire of card games, determinedly feeling upbeat. After a damp night we woke up at 6am for a pancake before pulling up near Moyo Island. We swam to the shore, clear skies overhead for a walk in land to a cool stream and waterfall. It was strangely reminiscent to be a part of the South East Asia travelling scene one year on, without Ricky and David by my side, with travellers fresh from the experiences we were having together last year. I had mixed feelings about it. We boarded the boat and had a few hours of sunbathing weather before snorkelling to Satonda Island. There was a beautiful stretch of corals and some lovely fish. Big cold splashes of rain began falling and we ran to the inland saltwater lake and it’s warm waters as the 12 o clock rains set in once more. Back on the boat we ate, our lunch laid out on a mat on the floor. Attempting a few games in the afternoon, many of us retired to bed mid afternoon to fight mild seasickness. We woke up again around sunset to watch Dolphins frolicking as they passed the boat, a mild mood lifter. We went to bed waiting for the dinner which was never served, and a long, wet and stormy night on board the boat. My journey so far has proved I’m a firm advocate of not flying but this night my stand was waivering. The boat stopped overnight to shelter from the storm, it didn’t manage to escape the waves however. In the morning we pulled on. From the depths of self pity, the sun was summoned and from this point the entire trip was transformed. We reached beautiful Laba Island, a calm cover with turquoise waters. 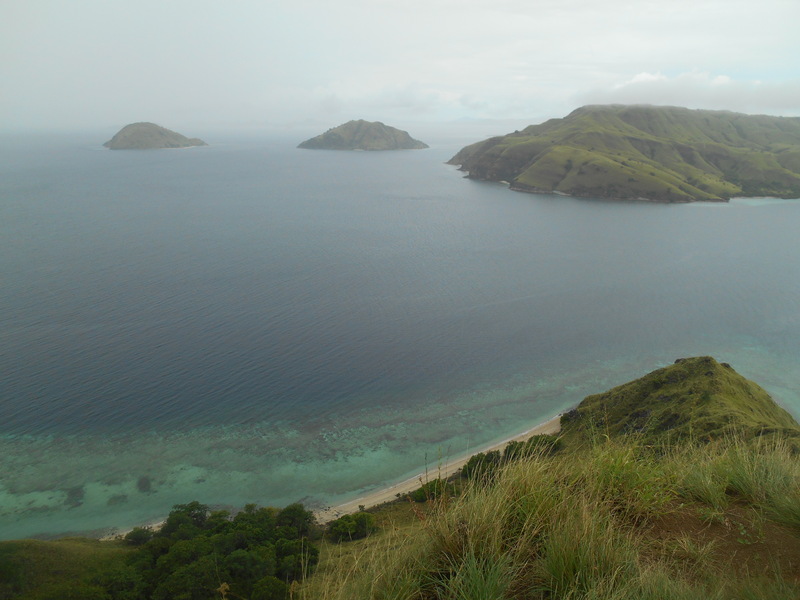 A steady hill climb brought us out to where we could see hundreds of islands on the horizon. 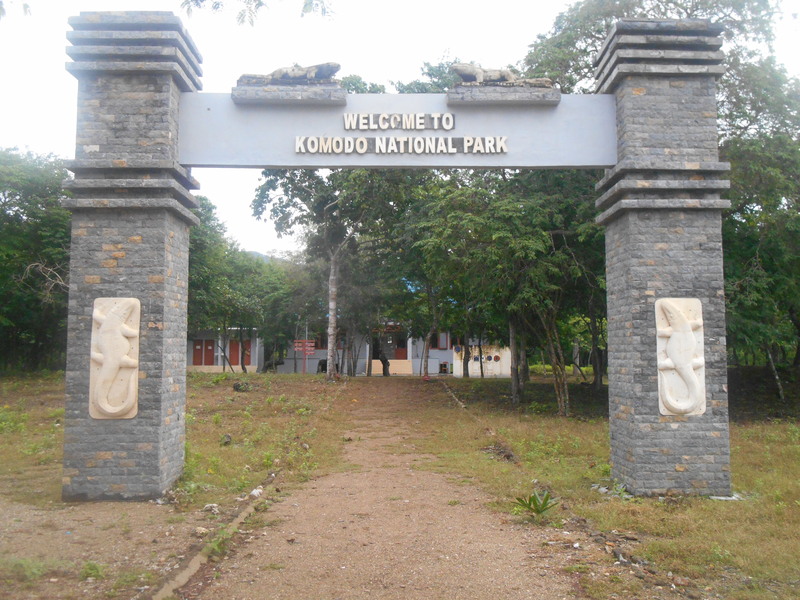 The beginning of Komodo National Park. At this point the characters of the group were emerging. The flashings of Fabian’s dry Dutch sense of humour and Roman’s rambling German stories caused much laughter. The big personalities of English and American, German and Swiss made for lots of fun on board. 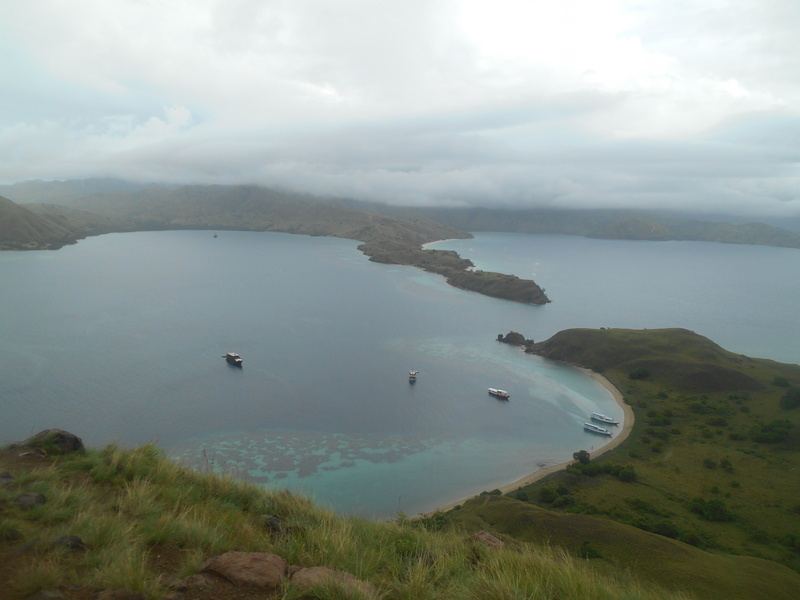 As we pressed on past Island after Island of green vegatation we approached Manta point. Without warning the guides shouted manta and we scrabbled to get into swimming gear and don our snorkels, jumping in flailingly to chase these graceful creatures. We saw three mantas of incredible size, two doubling back underneath us showing their effortless power as the swam. Such elegant creatures which never fail to surprise me each time I see them. All too soon it was time to press on to Red Beach. It was again in a beautiful area, slightly red but with some interesting corals to look at. We spotted a hawksbill turtle and scorpion fish in the water. Here we parked up for the night, relieved to have a night not on the move. Hoards of canoes from the local villages stopped aside us to flog necklaces with mantas on and bintang beer. As the sunset a huge swarm of flying foxes made flight from their cave, filling the night sky. As our last night on board we partied on the boat, free from the worry of seasickness. When we did run out of beer the canoes were nowhere to be found. 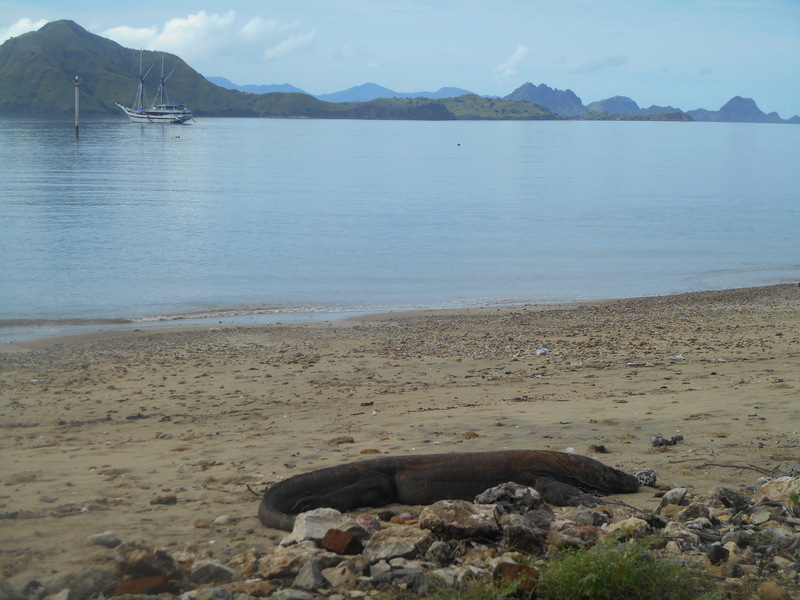 In the morning we approached Komodo Island, home to around 2800 dragons. 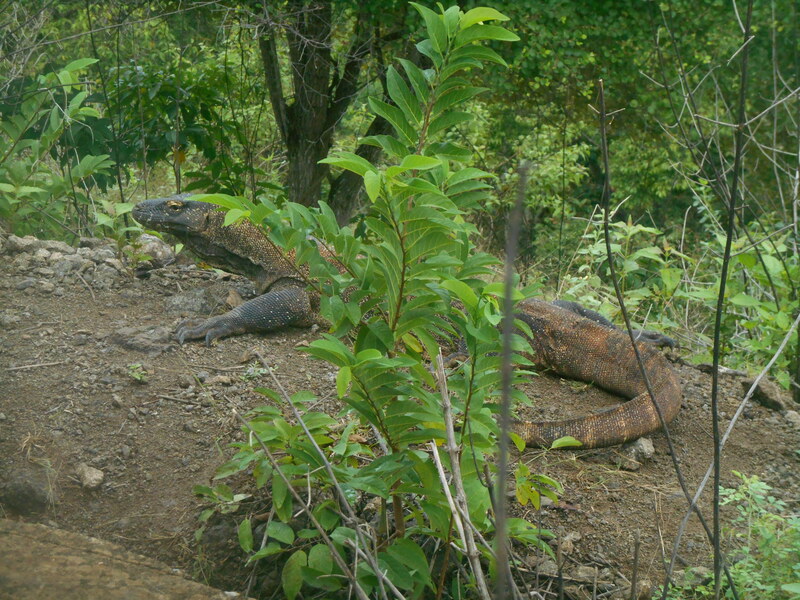 These incredible lizards have a poison which could bring down a buffalo and diet on pigs, dear and also their own young if available. For this reason the young live in the trees for the first year of their life. A big feed can last them one month as they can devour 80% their own body weight, taking them down with their venomous lick and then waiting 2-3 days for pay off. They can live to be 50 years old. 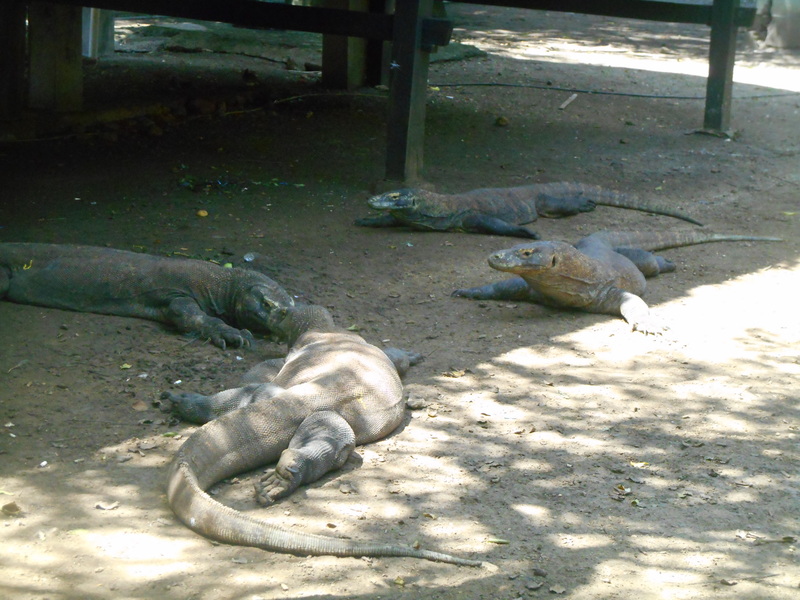 We walked an hours trail seeing a few scuttle off into the undergrowth as well as one regurgitate an earlier meal, however th most sightings were right back at the start where a few large male dragons were lolled lazily on the beach. 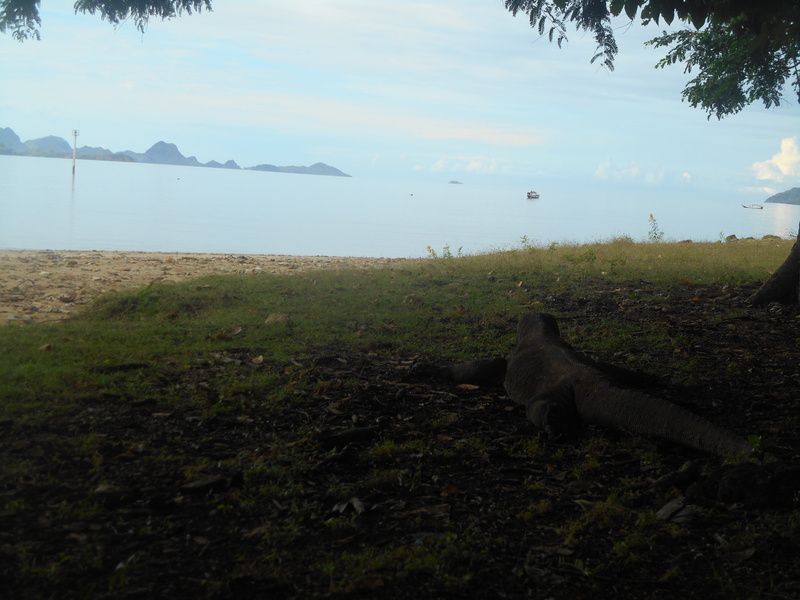 Rinca Island was our next stop, with a similar dragon population. Again the vegetation was lush and beautiful. 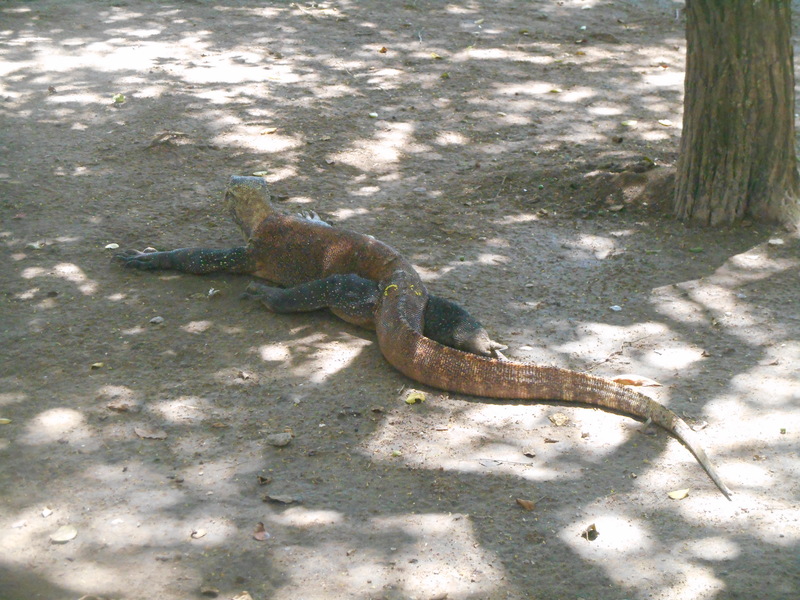 We spotted a small dragon in the tree, and several congregated around the smell of food near the rangers quarters. The guards were very wary of us not getting to close, although it isn’t an animal that strikes fear into you. It may know you are alert to its approaches but it seems lazy and slow, maybe it’s full from its last tourist dinner! 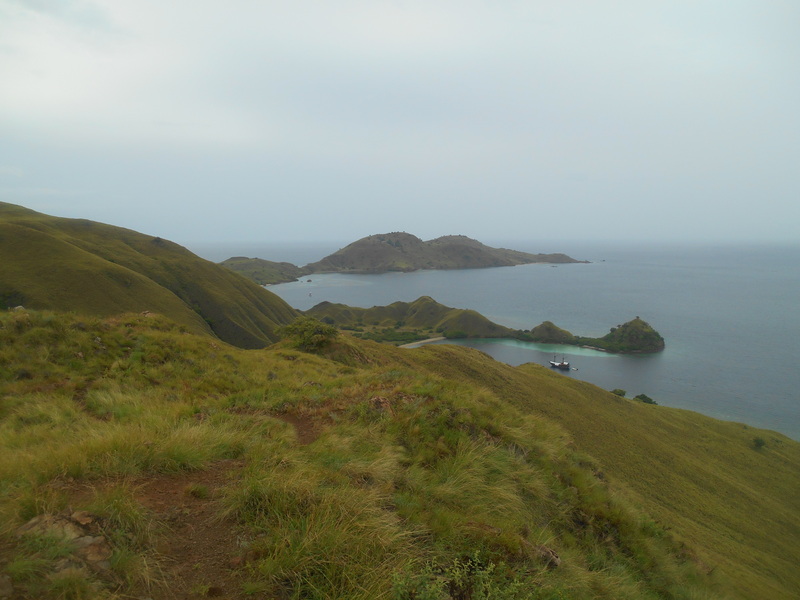 Between Rinca and Labuan Bajo was lots of small picturesque islands which you could lose weeks going between without having to share a bit of coastline. It is with this in mind that is one of the most striking peculiarities about the trup. The crew dropped the anchor in the middle of ocean blue for a snorkelling stop. As we went to pull the snorkels out of the hold the guide said, ‘don’t go too far from the boat, but the snorkelling is probably not very good here.’ It seemed very Indonesian logic! 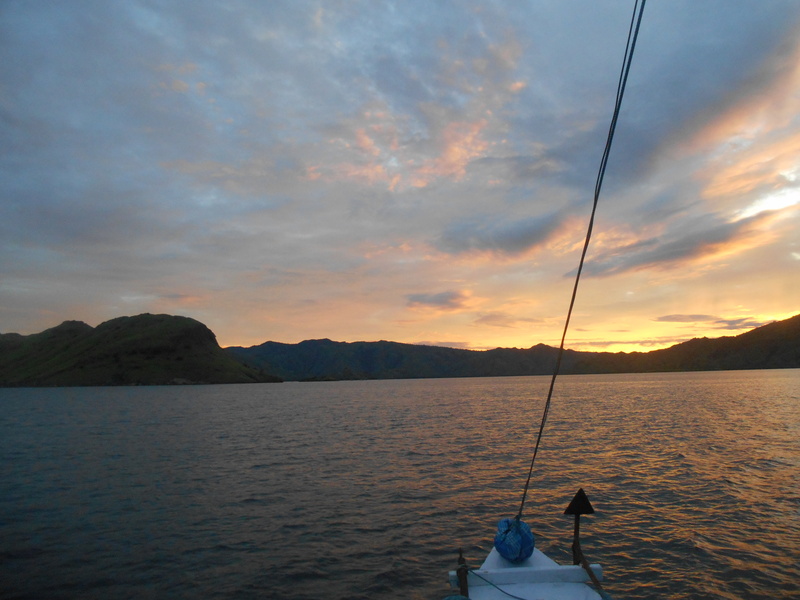 Late afternoon we pulled into Labuan Bajo, a town on the corner of Flores. Originally a Dutch settlement, this means flowers. It was an array of boats and a delightfully ramshackle harbour, or maybe we were pleased to be reunited with land! We found a basic hotel to spend the next couple of nights and set about organising diving for the next day. My watch was showing I hadn’t scuba dived in 88 hours, so I was getting withdrawals. We met at the dive shop and left for the harbour. On board we had snacks galore, a mighty change from our budget boat trip before. The first five was at Manta point and we saw 4 of these incredible creatures, one the ‘ninja manta,’ black on his front as well as his back. 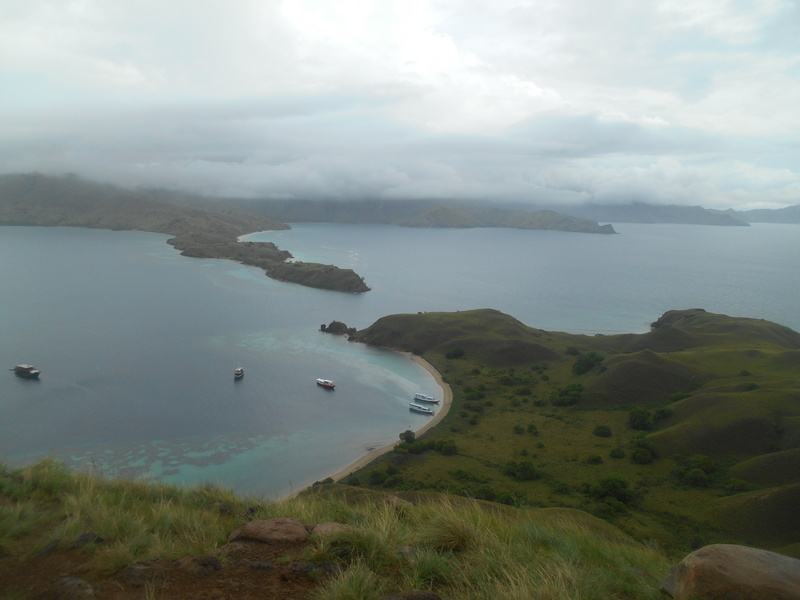 The corals were vibrant and stunning, although Komodo known for its currents has times of the year with much less visability. 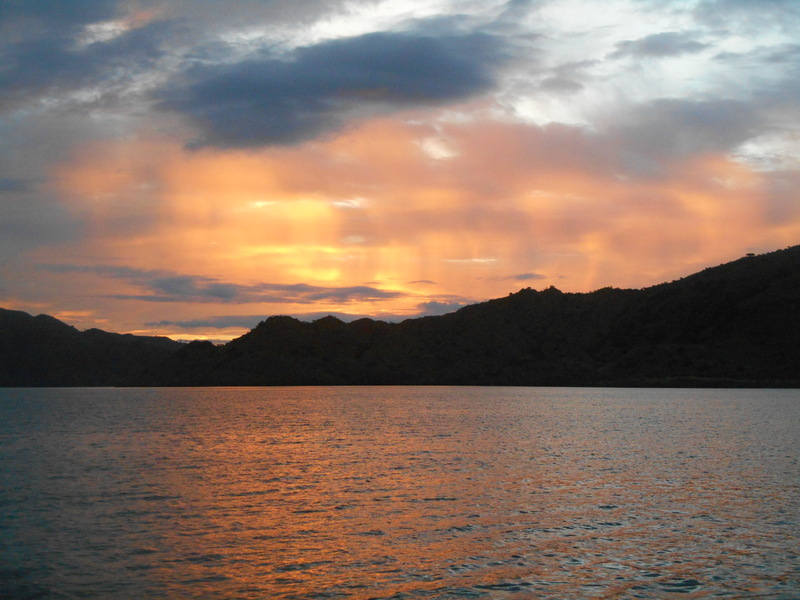 The second sight was a famous komod spot, diving next to an island I between a split current. The fish were everywhere, a colourful tornado of travelly, wrasse, coral and nudie branch. I spotted a huge camouflaged octopus which we marvelled at. As we turned to leave he caressed his way down the rock, changing colour as he went! In the evening we found a night market. Most of the stalls sold fish we had seen in the sea that day, re confirming my recent vegetarianism. 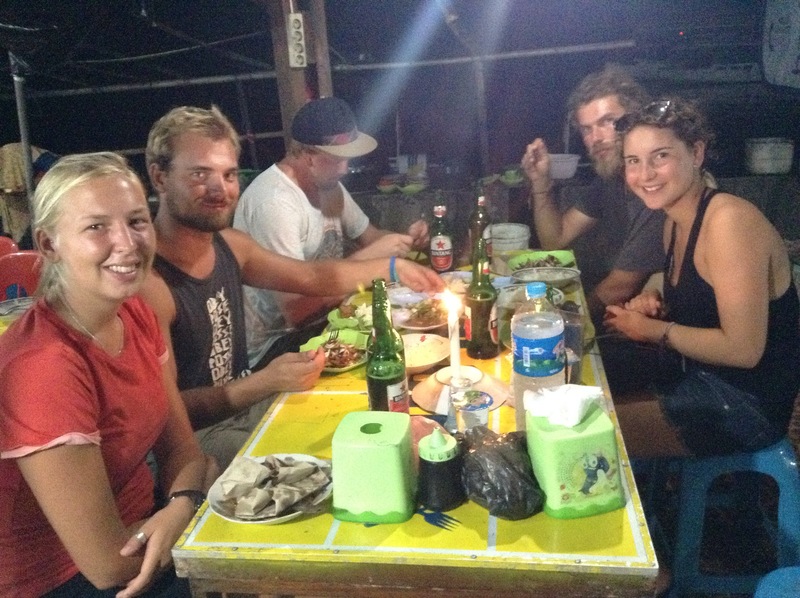 I was bold in using a bit more of my Bahasa to talk to the locals, another thing I am going to miss! We followed dinner with our last Bintang beers in Skygarden and the all to common goodbyes! 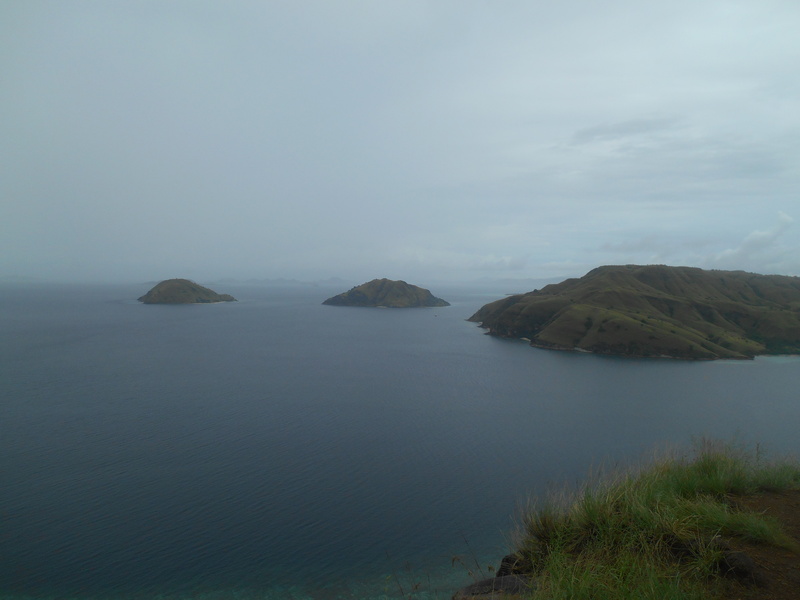 The next morning I walked through Labuan Bajo, sweating in the humidity whilst trying to appreciate the last heat on my skin before a New Zealand winter. 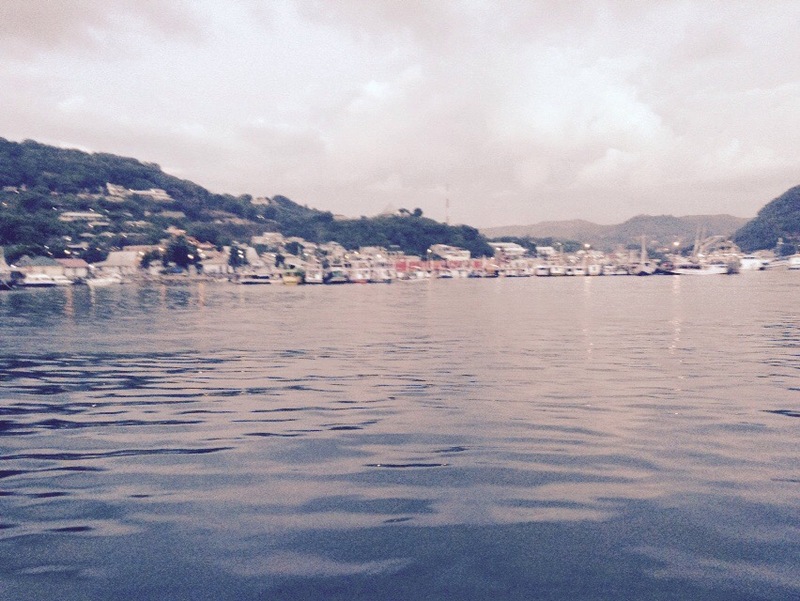 The town is rustic and dirty but with a relaxed dive culture and friendly locals, much nicer than I had anticipated. I had a good dose of the Indonesian cusine to which I have become so accustomed and set about finding myself transport to the airport, which cost 7,000 rupiah by motorbike, about 40p, but adventure considering juggling two bags and two people on a scooter. The flight was by small plane, about 1.5 hours, but a breathtaking trip back of the smattering of islands which is Indonesia, to Bali. Next up, New Zealand beckons, or more importantly, it’s time to embrace the cold and get a job. Next stop Auckland. 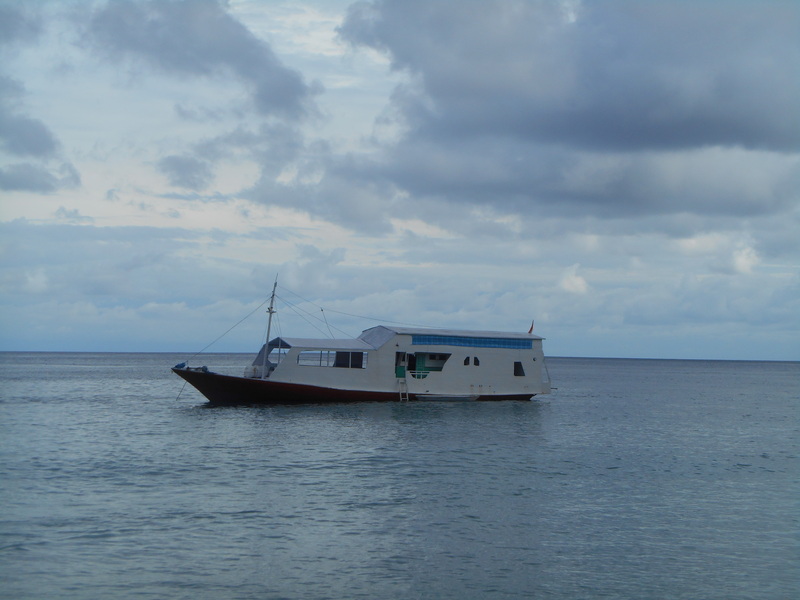 Previous Leaving Paradise… As a divemaster! Hello! Just read your blog. We are going on thid boat in 2 days! Did you enjoy it!? We are a bit worried maybe we should have booked a different boat. We booked cabin class also…did you see the cabin rooms? Firstly, I’m so jealous here in chilly Auckland, enjoy that sunshine! 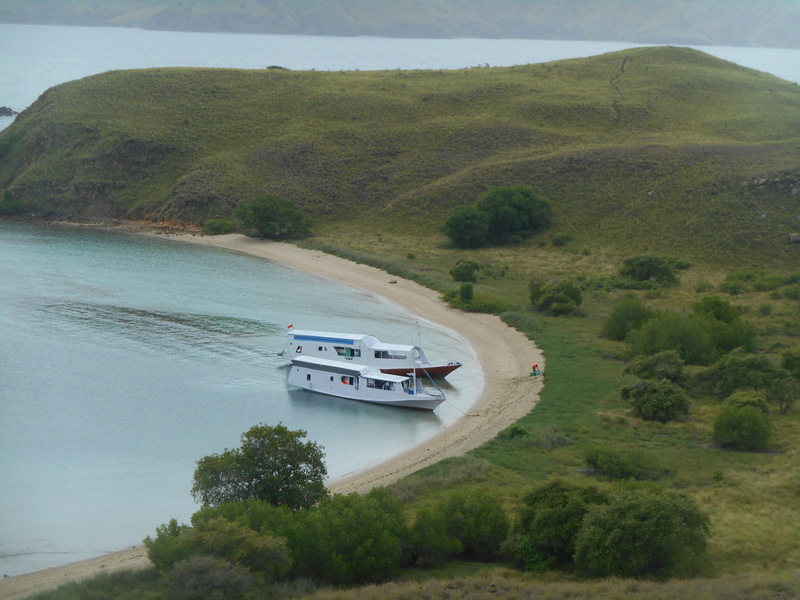 Are you booked with Komodo Adventures? There are several boats that do the route which all vary in amenities, this company is basic, one small toilet out back and no showers. The cabins will offer a little more privacy but they are very basic! The first two days are a lot of moving, little activity but if you get good weather and a nice group this should still be a good experience! What ‘dampened’ my trip (literally) was the weather. On such an open boat it made it claustrophobic and limited the options to playing cards and sleeping! Once the sun came out it was transformed, and more than worth it! Such a great destination and some gorgeous scenery, enjoy, and take lots of photos!